Amish Pine Wood Bookcase - 60"
This rustic, French-Country bookcase is constructed with screws instead of nails for a stronger, longer-lasting bookcase. Handcrafted and held to the highest standards of craftsmanship. 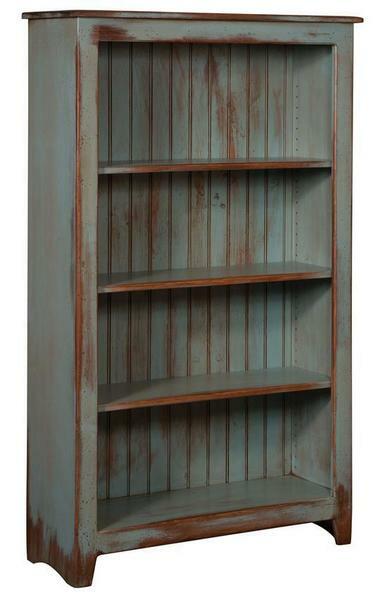 You can count on this charming, American-made bookcase to serve you and your family for generations! One picture of this bookcase is shown in our popular buttermilk painted finish, another is shown in our navy distressed antique finish and in our sea foam distressed antique finish. This bookcase features three adjustable shelves for a variety of storage options. The back paneling on this bookcase is simply stunning and will display beautifully through all the gaps between the books on the shelves, bringing warmth and rustic charm to your home or office! Contact us for additional information or ordering assistance on this beautiful pine bookcase.